Gluten Free Asian Chopped Chicken Salad Recipe - Gutom Na! Posted on Thursday, January 26th, 2017 at 6:12 pm. Combine ingredients in a small sauce pan over medium high heat. Bring to a boil stirring occasionally. Lower heat and simmer for 10 minutes stirring occasionally. Use back of spoon to break up miso and ginger. Strain sauce through a fine mesh sieve to remove any solids. Let cool in refrigerator. Heat PERDUE® SIMPLY SMART® Gluten Free Breaded Chicken Breast Tenders according to directions on bag. Combine lettuce, snow peas, red pepper, mandarin oranges, water chestnuts and pine nuts in a large bowl and toss. 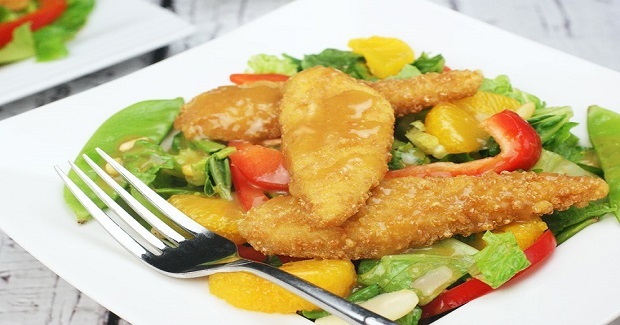 Serve salad in bowls with 3-4 chicken breast tenders. Serve orange ginger dressing on the side.